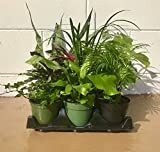 Asplenium nidus growing fern leaf plant of the genus Asplenium also known as Spleenworts nidus or Bird’s-nest ferns, Asplenium nidus perennial evergreen used as ornamental also house plant, grow in tropics climate 12+. Leaves color green with purple stem in the middle leaves, elliptic shape and wavy, leaves grow as rosette structure, the young leaves grow from the middle and rolled in the top. 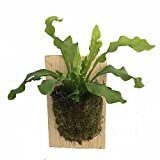 1 Rooted of Asplenium Nidus "Birds Nest Fern"
Japanese Bird's Nest Fern Growing on Walnut Wooden Plaque - Asplenium -9 x 5.5"